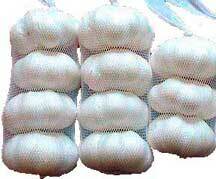 Tie Netting | Burnaby Bag & Burlap Ltd. This product is similar to the onion bag material. It is an open and flexible weave. 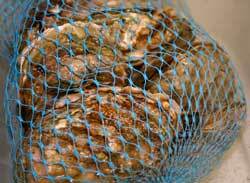 Some examples of usage would be for three bulbs of garlic, small samples of shellfish, 5 lbs of oysters etc. 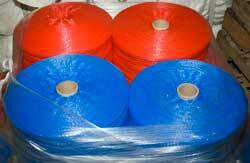 The tie netting can be bought in rolls or in precut lengths and are available in several strengths, colors and weaves. Jute is the name of the plant from which burlap is made. It is a very tall, grasslike plant which is grown for the strong fibres in its stalks. These fibres are cut and cleaned and then woven into the cloth we are familiar with today. Jute is 100% bio degradable and recyclable and thus Jute is eco friendly. It is a cheap natural fibre with a shine and is second only to cotton in terms, of global consumption production and availability.